Here's how Trey Ceilings are shaping up for 2019 in new homes - with octagonal, box, step, and double step Trey Ceiling styles. 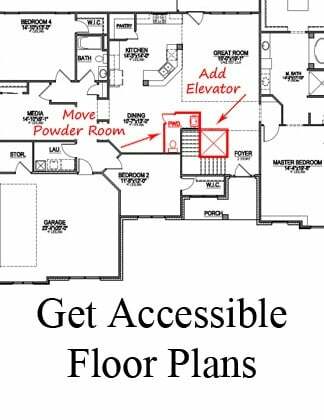 What rooms do Trey Ceilings go in? 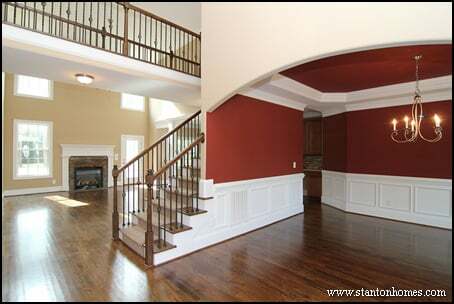 Custom home builders in NC can build a Trey Ceiling into just about any room in your new home. The rooms chosen most often for Trey Ceilings are master bedrooms and formal dining rooms. 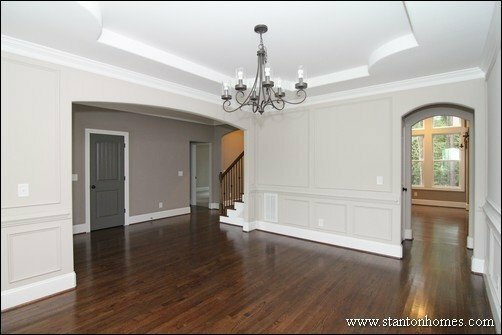 What Trey Ceiling styles are the most popular? Step, shallow step, vaulted, octagonal, angled, and single box Trey Ceilings are trending for 2019. Click on photos of these Trey Ceilings to see more pictures. Trey Ceiling Design #1 - This Dining Room has a Trey Ceiling shaped to match the contours of the room, with a grey and white theme, site finished oak flooring, and wainscoting to complete the formality. Trey Ceiling Design #2 - The trey ceiling in this Chapel Hill new home has sculpted corners to add artistry. 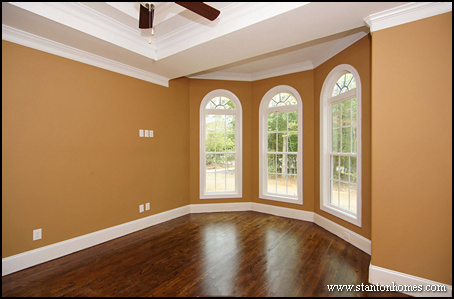 Arched entrances and full wall wainscoting add graciousness to this Formal Dining Room. Trey Ceiling Design #3 - This Formal Dining Room is wrapped in warm brown and white, with lots of natural light, custom designed wainscoting, and a ribbon octagonal Trey Ceiling. Trey Ceiling Design #4 - Double Trey Ceilings like this are popular in Master Suite Bedrooms. Here the softness of baby blue ribbon emphasizes the layering look and blends the ceiling with the walls. Trey Ceiling Design #5 - This Double Trey Ceiling in the Master Suite Bedroom emphasizes the grand dimension of this spacious retreat. The blend of earth tones and white gives the setting a serene feel. Trey Ceiling Design #6 - A few shades darker, this deep brown Master Suite Bedroom draws the eye to white steps in the Double Trey Ceiling. The raised height in this ceiling allows the depth of the tiers to be taller, adding a dramatic element. Trey Ceiling Design #7 - The Deep Trey Ceiling design selected for this Master Suite Bedroom creates a crowning effect of sophistication. A wall of windows and glass door to the the patio add lots of natural light that further enhances a feeling of spaciousness. 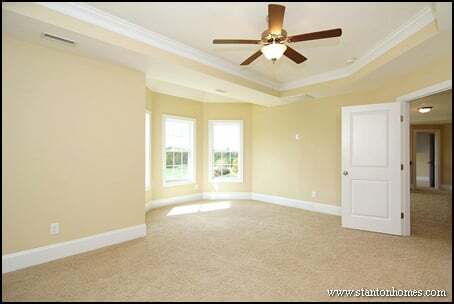 Trey Ceiling Design #8 - This Master Suite Bedroom white Trey Ceiling has two layers, accented with crown molding. The Sitting Area tucked in at the back of the room has its own little niche, behind the trey. Trey Ceiling Design #9 - Here's another approach to a multi-layer Trey Ceiling, in this Master Suite Bedroom bold with personality. Bright yellow and white layers make the room sunny and bright, while emphasizing the design's intricate tiers. Trey Ceiling Design #10 - Flirtatious romance can be created with multiple layers in the Trey Ceiling, like this Master Suite Retreat. Your color palette choice in a custom home can follow your imagination - whimsy, daring or conventional. 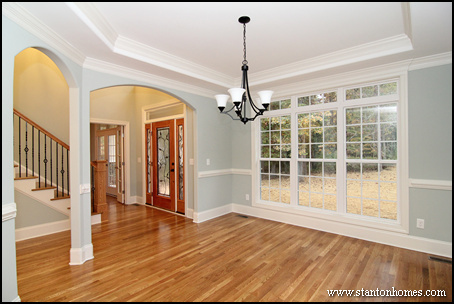 Trey Ceiling Design #11 - The classic look to this Formal Dining Room Trey Ceiling reflects elegance, with a welcoming openness and simplistic design that compliments expansive windows, massive archway entrances, chair rail trim, and hardwoods. Trey Ceiling Design #12 - Frame your Formal Dining Room with a Vertical Trey Ceiling like this to provide balance with your favorite wainscoting design. Color adds dimension, while white adds formality. 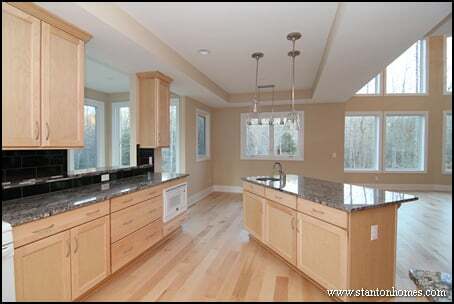 Trey Ceiling Design #13 - Create character in your Kitchen, with a huge Trey Ceiling across the entire room. What an unexpected way to prioritize the importance of this Chef's Kitchen. Trey Ceiling Design #14 - Keep it simple, with a basic Trey Ceiling with just a touch of color in the ribbon effect seen here. It's a great way to emphasize informality. The light green walls inspire a comfortable, casual purpose for this Dining Room. 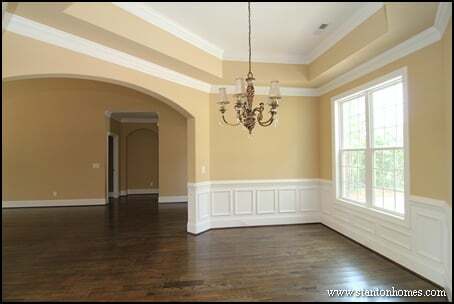 Trey Ceiling Design #15 - This Angled Trey Ceiling makes a statement as the crowning touch to a Formal Dining Room. Serving as a tie-together with incredibly detailed trim work, strategically placed arched windows and an art niche, this Trey Ceiling is the exclamation point. Trey Ceiling Design #16 - Give your Dining Room designer appeal, with a multi-layered octagonal trey ceiling accented by bands of color like this new home in Chatham County. Deep green and white color combinations with expansive archway openings provide a formal wrap to the room. Trey Ceiling Design #17 - When the emphasis is on the archways, you might want to opt for an all-white Octagonal Trey Ceiling in the Formal Dining Room. This subtle elegance element provides formality, without detracting from the artistry. 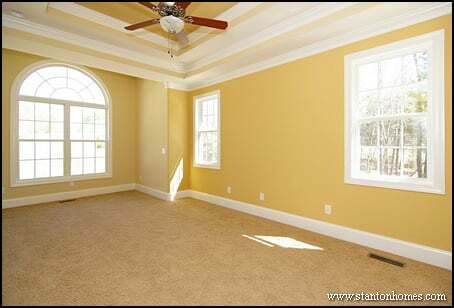 Trey Ceiling Design #18 - Simple and sweet, this Master Suite Bedroom is topped with a Trey Ceiling with a ribbon of yellow to match the walls. A Sitting Alcove beckons just beyond. Trey Ceiling Design #19 - When you enter your Formal Dining Room through the wide swoop of this dramatic arched entry, the bold red and white of this traditional Dining Room provides rich elegance reflected throughout. When you enter your dining room through the wide swoop of this dramatic arched entry, the bold red and white of this traditional dining room reflects confidence. When there's that much going on in the rest of the room, use your trey ceiling as a punctuation mark, like this. When building a custom home in Chatham County near Chapel Hill, NC - and across 12 counties in central North Carolina - a Stanton Homes Signature Trey Ceiling can add detail, dimension and depth to nearly any room. Here's how trey ceilings are shaping up for 2019 in new homes - with octagonal, box, step, and double step trey ceiling styles. Click pictures to see the full photo gallery for each home! Where do Trey Ceilings go? While Trey Ceilings can be placed in nearly any room of the home - from the kitchen to the great room - they are most often built into master bedrooms and formal dining rooms. What are some of the most popular Trey Ceiling styles? Step, shallow step, vaulted, octagonal, angled, and single box are trey ceiling designs that are trending the most for 2019. This Chapel Hill new home has rounded corners - designed to mirror the archways below. Deep browns contrast against the white painted wainscoting in this formal dining room - complete with an octagonal trey ceiling. Double trey ceilings are more popular in the master bedroom. These trey ceilings carry wall colors into the ceiling, to emphasize the layering look. This owner's suite trey ceiling emphasizes the grand dimension of this spacious personal space. The choice to bathe the room in earth tones and white creates a beautiful color palette for this setting. The layers in this trey ceiling are taller, emphasizing the raised height ceiling. 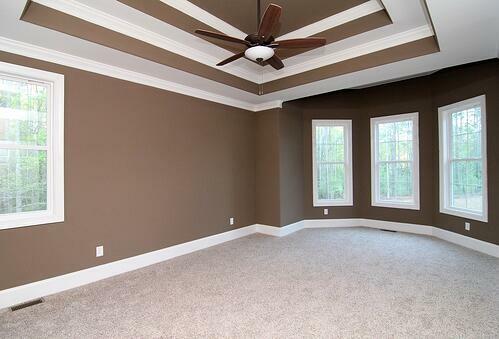 Although most ceilings are still white, treys with color are becoming more popular in Chatham County new homes. The deep trey design selected for this master suite creates a crowning effect of sophistication. Grey walls reflect the trending color trend, while directing the eye upward. 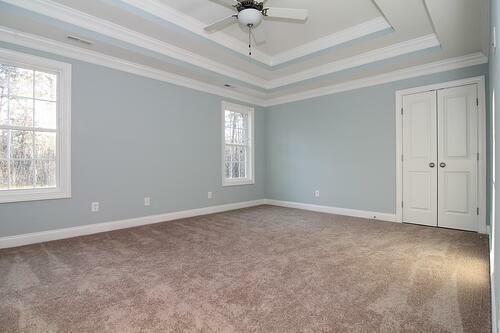 This master bedroom white trey ceiling has two layers with crown molding. The sitting area tucked in at the back of the room has its own little niche, behind the trey. Here's another approach to a multi-layer trey ceiling, in this master suite that's bold with personality. Bright yellow and white layers make the room sunny and bright, while emphasizing the design's intricate tiers. Flirtatious romance can be created with multiple layers in the trey ceiling, like this master suite retreat. Your color palette choice in a custom home can follow your imagination - whimsy, daring or conventional. The classic look to this formal dining room trey ceiling reflects the elegance of the room, with a welcoming openness and simplistic design that compliments expansive windows, archways, chair rail, and hardwoods. Frame your formal dining room with a vertical trey ceiling like this to provide balance with your favorite wainscoting design. Color adds dimension, while white adds formality. Create character in your kitchen, with a trey ceiling that goes over the space where you spend most of your time. This artistic chef's kitchen is topped with a huge trey basic box with another layer of dimension. Keep it simple, with a basic trey ceiling and a ribbon of color. This effect is popular with more casual lifestyles, where rigid formality feels out of place. This angled trey ceiling makes a formal dining statement. Serving as a tie-together with incredibly detailed trim work, strategically placed windows and an art niche, this trey says custom home. 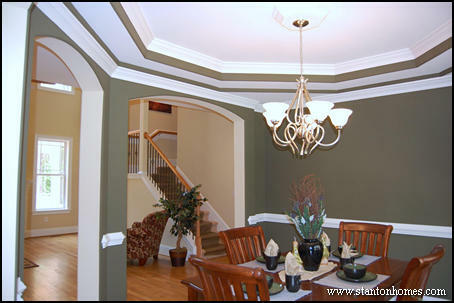 Give your dining room designer appeal, with a multi-layered octagonal trey ceiling accented by bands of color. When the emphasis is on the archways, you might want to opt for an all-white octagonal trey in the formal dining room. This provides formality, while keeping most of the attention elsewhere. Simple and sweet, this master suite with trey ceiling has a soft, warm feeling, with a sitting alcove that beckons just beyond. 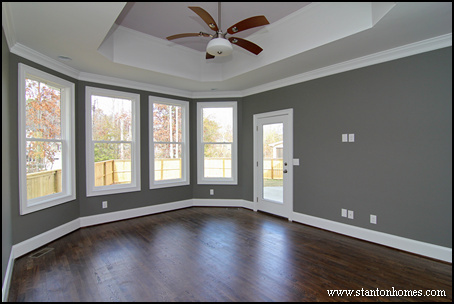 When building a custom home in Chatham County near Chapel Hill, NC - or anywhere throughout central North Carolina - a Stanton Homes Signature Trey Ceiling can add detail, dimension and depth to nearly any room. 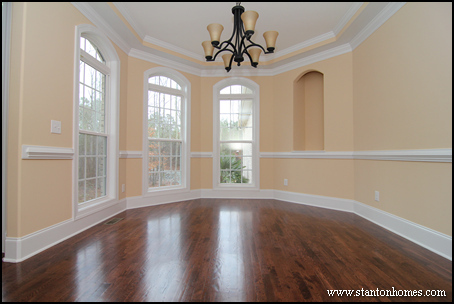 Trey ceilings are one of the most popular additions to Chatham County new custom homes. 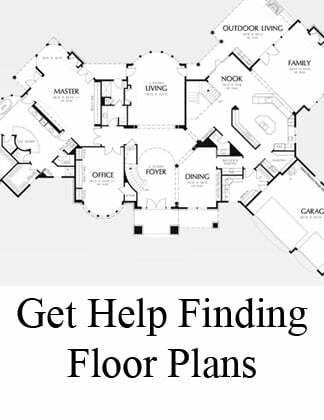 Get ideas for your new home design, with these photos of octagonal, box, step, and double step trey ceilings. 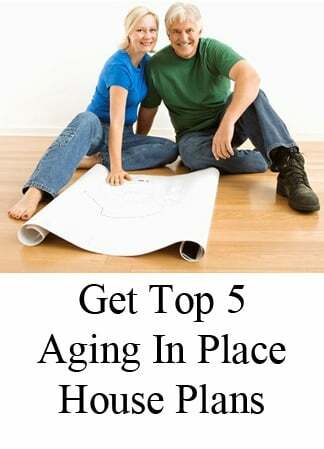 Click any photo to see the full photo gallery for that home! 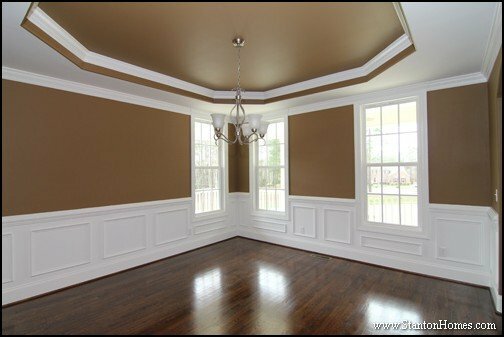 Where are Trey Ceilings placed within a home? While Trey Ceilings can be placed in nearly any room of the home - from the kitchen to the great room - they are most often placed in master bedrooms and formal dining rooms. What are some of the most popular Trey Ceiling styles? Step, shallow step, vaulted, octagonal, angled, or single box are some popular trey ceiling designs. Double trey ceilings are more popular in the master bedroom. These trey ceilings carry the wall colors into the ceiling, to emphasize the layering look. The ultimate master retreat is topped with this owner's suite trey ceiling that emphasizes the grand dimension of this spacious personal space. The choice to bathe the room in earthtones and white is the perfect color palette for this setting. The layers in this trey ceiling are taller, emphasizing the raised height ceiling. 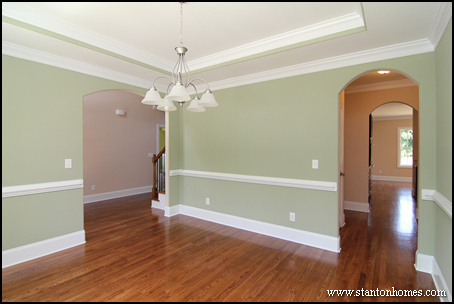 How many ceilings are painted white versus the wall color? We've found that white ceilings are slightly more popular - although lots of Chapel Hill new home buyers request painted ceilings as well. The deep, white trey design selected for this master suite creates a crowning effect of sophistication. Grey walls reflect the latest color trend, while directing the eye upward. Flirtatious romance can be created with multiple layers in the trey ceiling, like this master suite retreat. Your color palette will reflect the tone you want to reflect, whether you tend toward whimsy, daring or conventional. Create character in your kitchen, with a trey ceiling that goes over the space where you spend most of your time. This example is clean and crisp, with a simple box appeal that serves as an extension of the show stopper chef's kitchen. 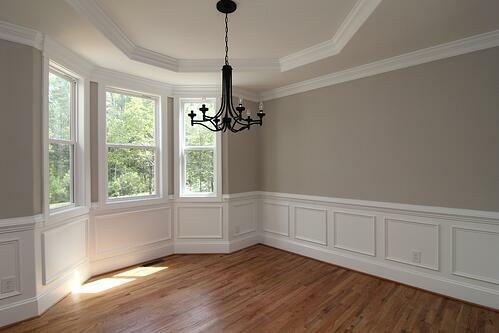 Keep it simple, with a basic trey ceiling with accent color for just a touch of formality. This effect is popular with more casual lifestyles, where rigid formality feels out of place. This angled trey ceiling makes a formal dining statement as a warm welcome to every sit down meal. 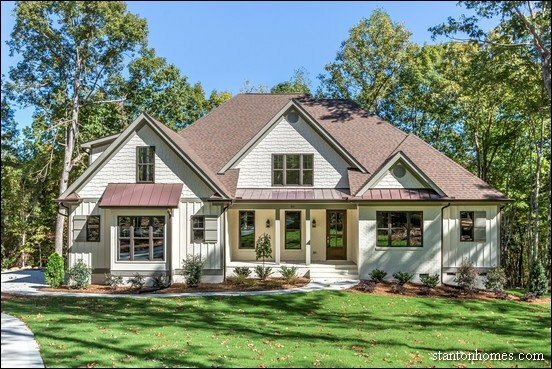 Serving as a tie-together with incredibly detailed trim work, strategically placed windows and an art niche, this trey reflects the ceiling appeal of custom homes. Give your dining room an incredible designer appeal, with a multi-layered octagonal trey ceiling accented by bands of color. When the emphasis is on all the archways, you might want to opt for an all-white octagonal trey in the formal dining room. This provides the expected formality, while keeping most of the attention elsewhere. 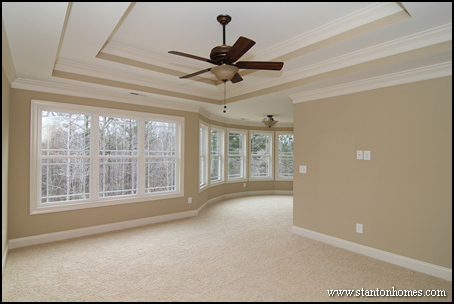 When building a custom home in Chatham County near Chapel Hill, NC - or anywhere throughout central North Carolina - a Stanton Homes Signature Trey Ceiling can add detail, dimension, and depth to nearly any room. 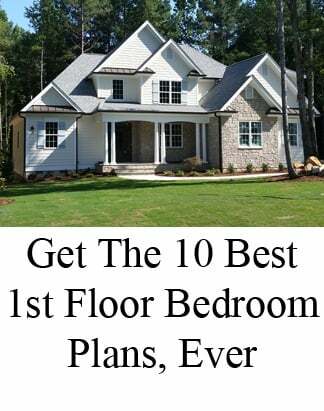 Looking for move-in ready or under construction homes near Chapel Hill? One of the biggest reasons to build a truly custom home is the character you can add - such as including specialty ceiling designs. 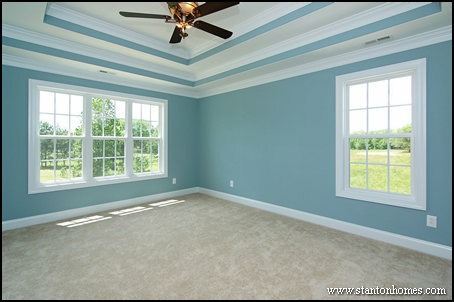 Trey ceilings are one of the most popular additions to Durham custom homes. What are some of the most popular Trey Ceiling styles? Step, shallow step, vaulted, octagonal, angled, or single box are some popular trey ceiling designs - see these in the photos below. Click any photo for a link to a full floor plan and a full video tour of the home this trey ceiling is featured in! Look at the layers! This master suite white trey ceiling adds line after line of dimension with dramatic impact on this owners retreat. The sitting area tucked in at the back of the room has its own little niche, behind the trey. 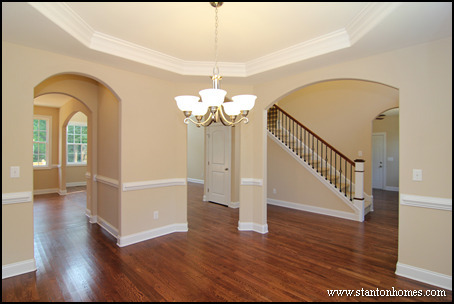 When building a custom home in Durham, NC - or anywhere throughout central North Carolina - a Stanton Homes Signature Trey Ceiling can add detail, dimension, and depth to nearly any room. See more photos of custom home ceiling styles, below. Coffered Ceilings - What is a Coffered Ceiling? What Ceiling Height Should I Choose?